Remember the first year your heart was filled with joy, your home was filled with fun madness and companionship, the year you rescued your dog. Place a favorite photo of your pet in the Rescued Year To Remember Frame. 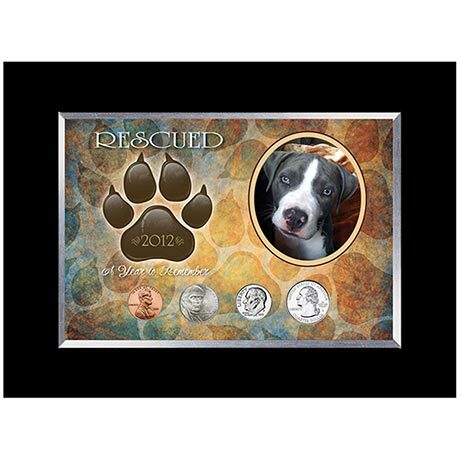 The black 9x7 inch desk frame celebrates the year you rescued your pet with genuine US coins minted from that year. A Lincoln cent, Jefferson nickel, Roosevelt dime and Washington quarter honor your pet's rescue. Presidents Washington, Jefferson, Lincoln and Roosevelt all embraced dogs as part of their families. Select the year you rescued your pet. A Certificate of Authenticity is included. Allow 2-3 weeks for delivery. No rush or gift box. Item can only be shipped within the Continental US.